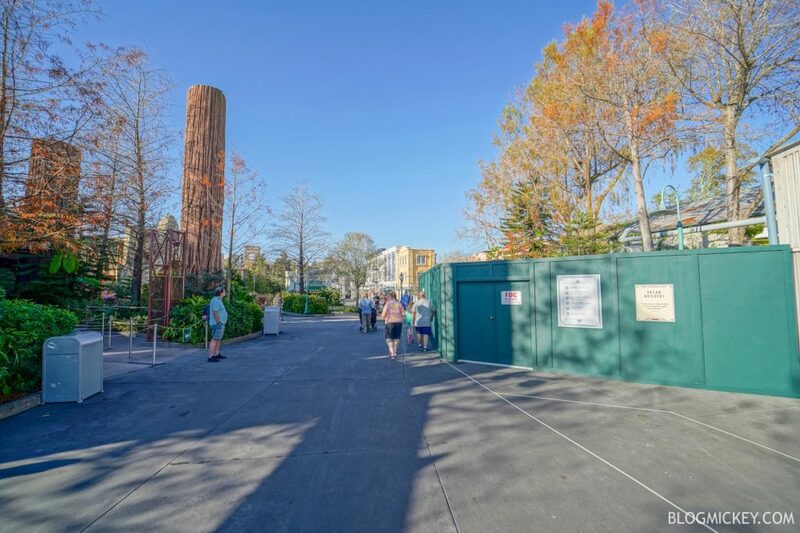 Walls are now up on the north end of Grand Avenue at Disney’s Hollywood Studios as the park prepares for the opening of Star Wars: Galaxy’s Edge later this year. 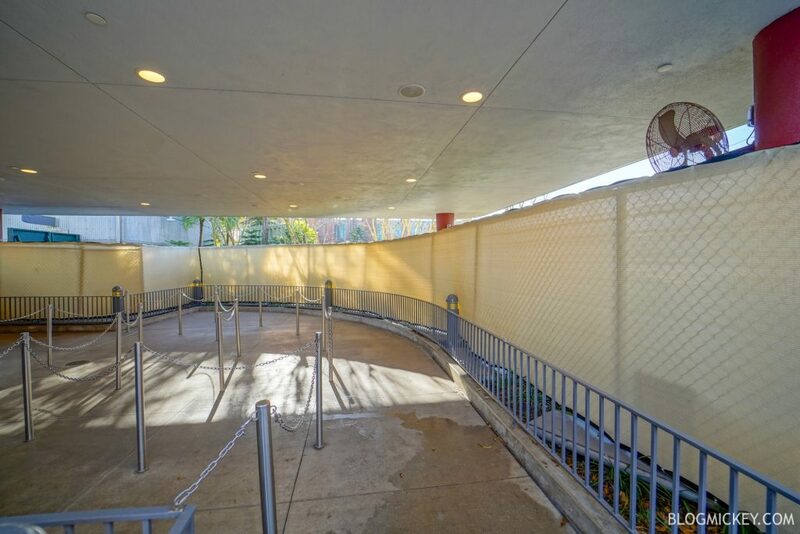 The walls extend from Mickey and Minnie’s Red Carpet Dreams to Star Tours. 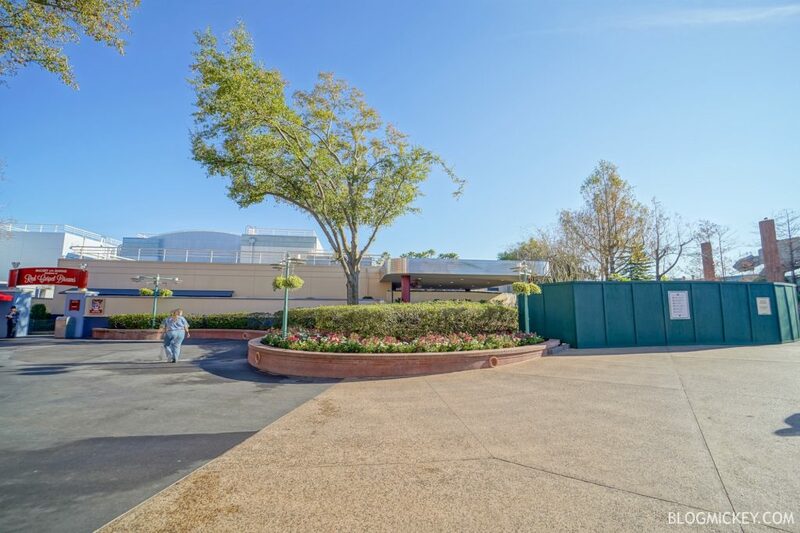 While most of the space is simply planters, the Star Wars Speeder Bike photo op is also behind walls. Cast Members inspecting the area this morning were discussing a path widening project. Here’s a look at the area impacted, starting from the Red Carpet Dreams meet and greet and ending near Star Tours. The queue of Mickey and Minnie’s Red Carpet Dreams has walls up as it serves as the backside of the construction area. The first thing we noticed is that the old DVC kiosk is now completely removed. It has been replaced by a recently opened kiosk on Grand Avenue. The DVC kiosk sat where the darker cement can be seen in the photo below. It’s possible that the next thing to be removed would be this flower bed and tree. Continuing along, we can see how much the walls extend into the pathway. Grand Avenue and the Muppets Courtyard are not pulling huge crowds, so this shouldn’t be an issue as far as crowd flow. The Star Wars Speeder Bike is still installed behind the walls, but its future is uncertain. 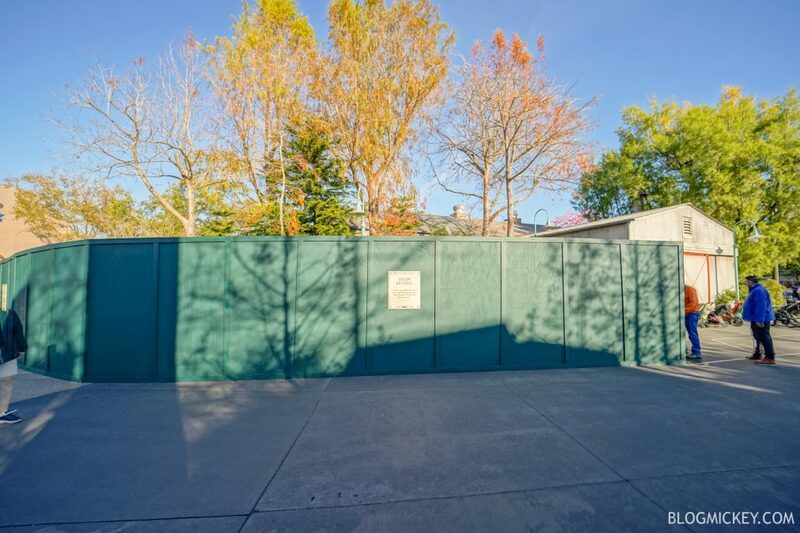 With Galaxy’s Edge being the location for Star Wars for years to come, it would seem unlikely that it will still be there when the walls come down. Time will tell. 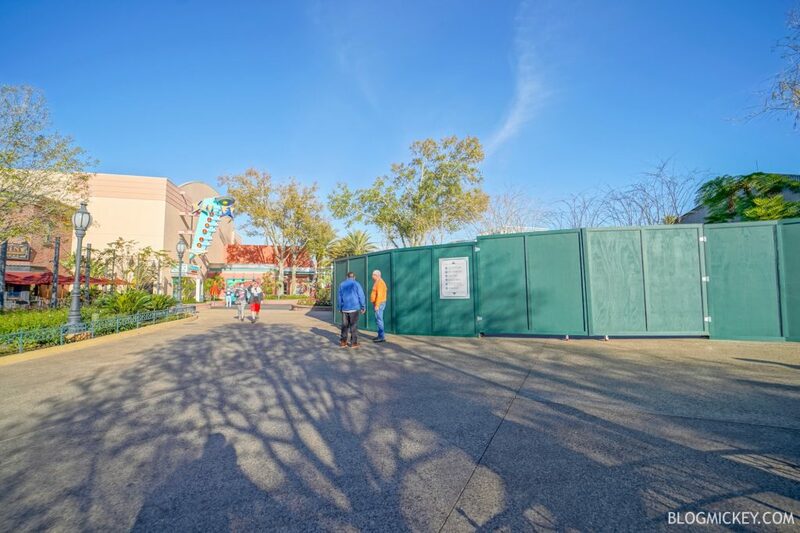 Here’s a view of how the walls come into the walkway as you’re passing Star Tours and walking towards Grand Avenue. 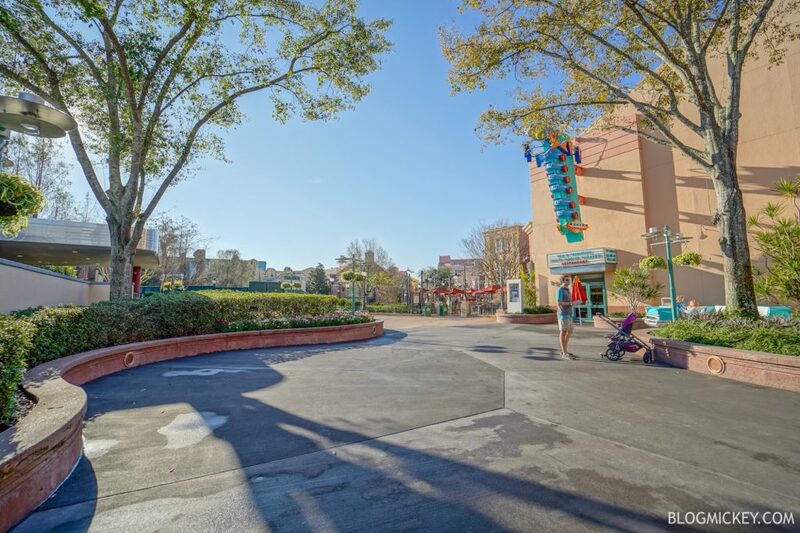 It seems like Disney’s Hollywood Studios is in the same position as Disneyland, trying desperately to gain any inch of guest walkways that they can to deal with the huge influx of guests expected to descend upon Disney’s Hollywood Studios later this Fall when Star Wars: Galaxy’s Edge opens.